Also known as the plasma membrane, this is the outer layer that covers all cells and certain cell organelles. The diagram below shows a simplified version of the fluid mosiac model of the membrane. The membrane is made of a bilayer of phospholipids. Where the hydrophobic tails points inwards to keep away from the water and the heads point outward. Embeded within the bilayer are proteins, those which span the entire membrane are called intrinsic and those which sit on the surface extrinsic. 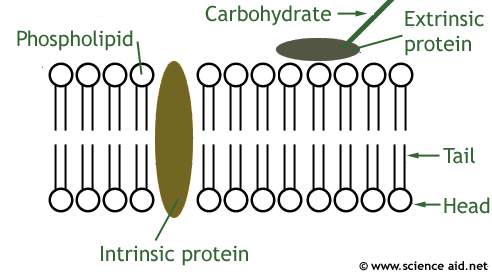 These proteins are very important because they allow for active transport (see below) and along with carbohydrates, for identification and as receptors. Facilitated diffusion still is a movement in the direction of a concentration gradient; but it involves moving through a channel protein or a carrier protein. A channel protein is simply a pore in the membrane made of protein, and is often gated to control movement. A carrier protein has a binding site which the substance attaches to, and it is then moved through the membrane. For more information about Osmosis see Osmosis. Osmosis is just diffusion with water: it just has a special name because water is very important to life. We speak about Osmosis in terms of water potential, which can be represented by the Greek letter Ψ 'psy'. We say that water moves to a less negative water potential because in distilled water Y = 0. So the more concentrated a solution is, the more negative it's water potential is. An isotonic solution has the same water potential as the cell. So there is no net movement of water and a cell stays the same size. A hypertonic solution has a more negative water potenial (more concentrated). Therefore water leaves the cell, an animal cell crenates (shrinks) and a plant cell will become plasmolysed, the diagram below shows this. A hypotonic solution has a less negative water potential (less concentrated). This means more water enters the cell; an animal cell may burst (lysis) however, a plant cell which has a cell wall to protect it will become turgid. This is the movement of particles across a membrane by carrier proteins, against the concentration gradient. Because of this, the process required energy. The most common way is a protein pump. This is an enzyme imbedded in the membrane. This enyme catalyses ATP, which produces energy; this energy then causes it to change shape and move the substance through the pump. Every molecule has a different protein pump.